Blend Off! is a game by Scot Eaton, published by Thunderworks Games. It is for 2-4 players. In this game, players take on the role of Master Mixers at the local Smoothie Shop. They’ll be racing to collect fruit in their blenders to fill orders with. Each time they complete an order they will gain gold stars from the shop owner. In the end the player that gains the most gold stars will be declared the winner. Before going into the overview, it should be noted that the different aspects of the game are referred to a little bit differently. The deck of cards is referred to as the Becca deck, as Becca is the shop owner that will be giving orders. The dice are known as Kevin. Kevin is the runner that goes and gets the fruit for each Master Mixer. The players are known as Master Mixers. They will be mixing up the fruit to make smoothies in their 2 blenders. 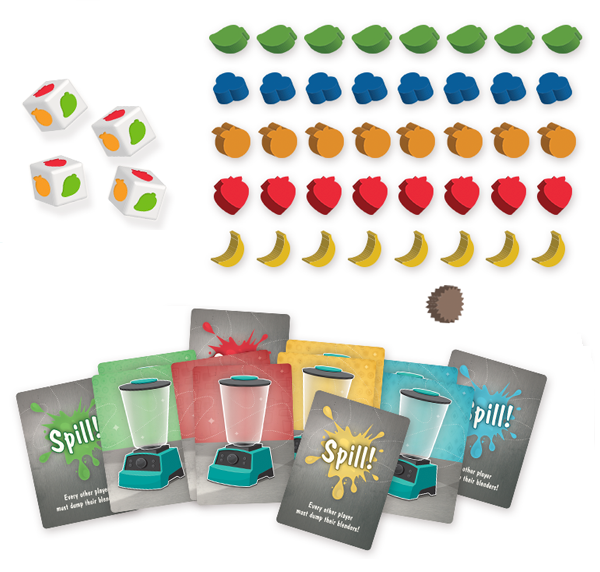 To begin, each player chooses a color and is given a fruit die and two Blender cards in their chosen color. The Blender cards are placed face up in front of each player. Fruit tokens of each type are placed in the middle of the play area equal to the number of players plus 2, along with the durian token. The remaining tokens are returned to the box. The Becca deck is created by using the orange cards as well as all the colored cards that match the player’s blender cards. The deck is then shuffled and the bottom card is checked. If it’s a Special Order card, the deck is cut until the bottom card is a standard order card. Once that happens, the players are all shown the bottom card and the deck is placed face down in the middle of the play area. The first set of Orders are drawn from the top of the deck and placed face up on the table. Cards are drawn for each player plus one. If a Special Order is revealed, certain rules are followed, which will be explained in more detail in a moment. Once players are all ready, one player gives a count of, “Ready, Set, Blend!”. Play now begins. In this game, there are no player turns. Everyone plays simultaneously performing 1 of 4 different actions. The actions are Collect, Dump, Blend and Blunder. The first action is the Collect action. To perform this action, the player rolls their die and then collects the fruit token that matches the face up side of the die, placing it into one of their blenders. If they don’t like the result, they may choose to reroll. If the player rolls a question mark, they can choose a fruit of their choice, except for the durian. The next action is the Dump action. The Dump action is used to completely dump out the contents of one of the player’s blenders. To do this, the player simply removes the ingredients from the blender and places them either back in the middle of the play area or into their other blender to combine ingredients. This will then empty out and free up a blender. Another action is the Blend action. This action is used once a player matches the recipe for one of the order cards exactly. 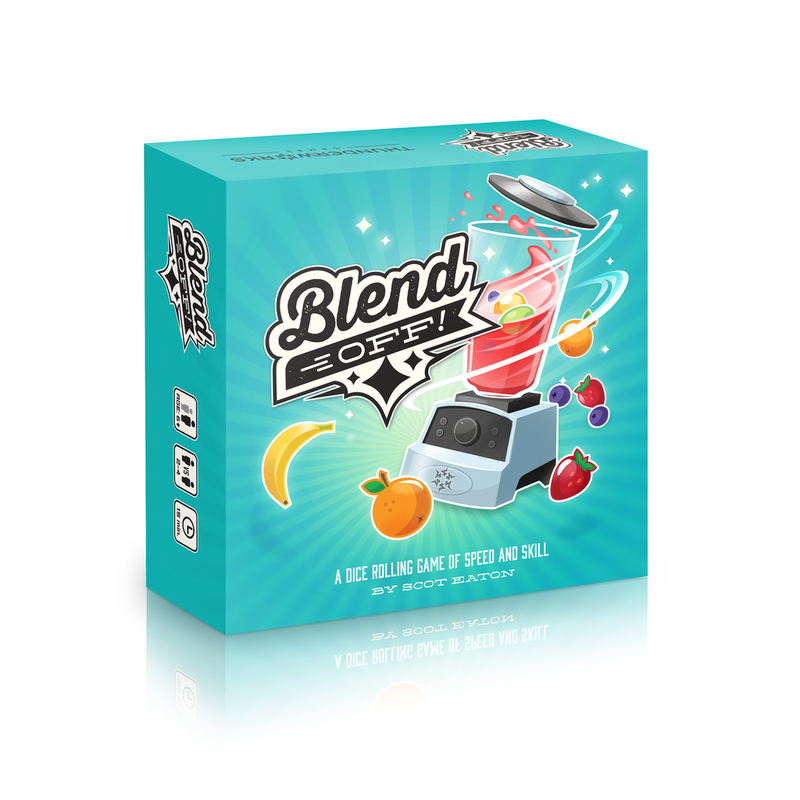 To perform the action, the player shouts, “Blend!” The player then takes the order card and checks to make sure that the smoothie is correct with the recipe. If it’s not, the player places the order card back. If the order is correct, the player then draws the next card from the Becca deck and places it face up on the table. If a Special Order is revealed, certain rules are followed, which will be discussed in just a moment. The player then returns the fruit tokens from the corresponding blender back to the middle of the play area. They’re then able to continue. Earlier I mentioned Special Orders, let me explain what they are and how they work. Special Orders are orders that modify the recipe and star value of another order. When these are revealed, they are placed face up on the table. Another card is drawn and placed face up on top of the Special Order card so that the bottom portion showing the modifications is showing. Those modifications are Add and Hold The…. Add means that the fruit displayed must be added to the recipe. Hold The… means the fruit displayed is removed from the order. It should be noted that if when drawing the next card, it too is a Special Order, then it is placed on top of the previous Special Order and yet another card is drawn. This continues until a standard order card is drawn. One last thing of note is the Durian. This fruit token comes into play whenever a player rolls a fruit that has been used up and there are no more remaining tokens to take. The player that rolled is then able to place the durian into another player’s Blender as long as they are not taking the Blend action. This forces the player to dump their blender with the durian token into the pile of fruit tokens in the middle of the play area. The game continues until all the orders have been filled and the Becca deck is empty. Once that happens, the game ends. Players add up their gold stars from all their completed orders and special order cards. The player with the most gold stars is the winner. This game has some of the nicest components that I’ve ever seen, especially in a small box game. First off there is the amazing looking fruit tokens. Each of these is wooden and brightly colored. Each one looks just like the fruit that it’s supposed to represent. These would most definitely be my most favorite part of the game. Next there’s the fruit dice. Each one is hard plastic but have indented icons of each of the different fruit tokens, as well as a big question mark for choosing any token. These are very nice and I love the way that they compliment the tokens. Finally there are all the cards. There are the very nice blender cards which have different colored backgrounds for each player. Each player has 2 colored cards. I especially like how that the blenders are turned different directions, as if you were actually running a smoothie shop. There are all the order cards which have a picture of the smoothie that they represent along with the fruit token icons and a bright colored background. Finally there are the rules/spill cards. These look nice and are a great player reference. Thematically, the pieces make sense and look great. Overall, I’m very impressed with the look and feel of the game. The rulebook for this game is a large sheet of double sided paper. It’s got a glossy finish and folds up to fit nicely inside the box. There are a couple of pictures of the dice and fruit tokens but that’s the only images present. There aren’t really and examples of gameplay, but that’s fine as the rules are pretty easy to follow. Everything is explained really well and in detail. I didn’t find anything that was difficult to understand. Also included in the rules are 3 different variants to the game, that I didn’t go over in the overview. There’s the Enduriance Challenge, the Race and Blend Off Jr. I’ll discuss these in more detail in the gameplay section. Just know that these are included and add quite a bit to the game. Overall, I really like how well the rules are written and how good they look. This is a really fun game that can be played several different ways. Earlier I mentioned the 3 variants that were included in the rules. Let me go a little deeper into what these actually do. The Enduriance Challenge adds the purple Order card to the deck during setup and rewards players that place the Durian token into one of their own blenders with 4 stars. The Race is a speed game where players race to compete their own orders with their own fruit tokens. There is no back stabbing or take that aspect in this variant. Players win for completing their orders followed by the Sweet Nirvana order placed in the middle of the play area. Blend Off Jr. is for playing with younger players in a turn based style game. Players are able to roll all 4 dice, set aside any dice they want to keep and then reroll. They then gain fruit tokens for any pair of matching dice. Like the normal game, the player with the most stars after the deck runs out is the winner. I’m really happy to have the included variants and think that they add lots of replayability to an already fun game. As for the normal game itself, it’s all about quick reflexes and some lucky die rolls. There’s a little bit of take that to the regular game but not so much that it makes the game annoying. I really like filling orders using the tokens. There’s just something about those fruit tokens that really appeal to me. This is not a hard game and it’s not one that has a lot of strategy to it. I think fans of games like Dr. Eureka, Steam Time or Loonacy should really enjoy this one. This really fits in with that real time category. I would definitely recommend picking this one up. It’s big fun in a small box. Blend Off! is a fast paced game of dice rolling where players compete to fill orders. It’s a fairly quick game to play. Most game sessions last around 10-15 minutes. Some of the variants might increase this time by a few minutes, but nothing major. The game has some of the most amazing looking pieces for such a small box game. I really love the brightly colored fruit tokens. They are the star of the game in my opinion. There’s not a lot of strategy but with the included variants, there’s a good deal of replayability. Fans of real time and dice rolling games like Dr. Eureka, Steam Time or Loonacy should really enjoy this one. This game is pretty light and is one that the entire family can enjoy. I especially like the inclusion of the Blend Off Jr. variant so that the younger players can join in. This is a game that I really enjoy. I would definitely recommend it. Order up! For more information about this and other great games, please check out Thunderworks Games at their site. This entry was posted in Reviews and tagged blend, blend off, board, board games, card, card games, eaton, games, off, scot, scot eaton, thunderworks, thunderworks games. Bookmark the permalink.